Iwas given my Grandma’s on my 21st, a friend got a new one to add to for another milestone birthday, and a colleague inherited hers many moons ago but still adds to it regularly. Charm bracelets have long been a family-led tradition, but, thanks to a resurgence of amulet-esque jewellery in the spring/summer 2018 collections, their status has changed. Now, charm bracelets are back in the spotlight as of-the-moment items that chime with fashion’s personality-driven mood. Romance: it wasn’t lost on designers at the shows last September, where charms were also presented as collector’s items. At Dior, Maria Grazia Chiuri added to her Sixties art scene-inspired collection with piled-on bracelets reminiscent of the sorts that are amassed following global travels and experiences not to be forgotten. She followed suit with necklaces, dripping in semi-precious stones. At Gucci, too, there was a similar desire to channel eclecticism. And nothing realises Alessandro Michele’s escapist urge more than the piling of charms upon charms. 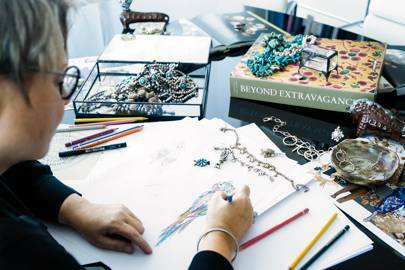 Kölbli has been designing charms for Thomas Sabo for 25 years. In that time, little has changed when it comes to the way that the team of six designers work. Inspiration mainly comes from the women they meet and see on the street in Berlin. However, with advances in technology, the German team can also be reactionary should a certain motif or symbol quickly take up a new cultural significance. 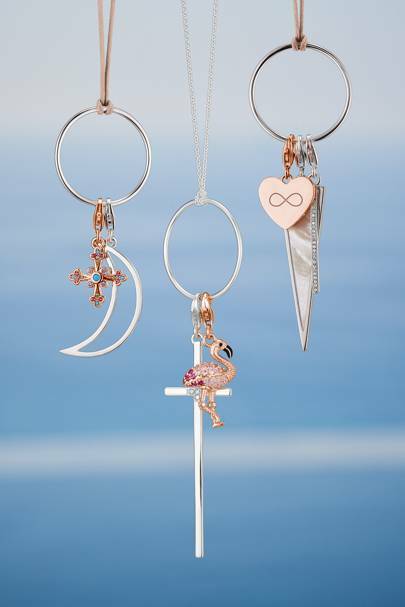 From the early design stages to arriving in a store, charms can be delivered within four weeks. Servicing an international customer base has led to a niche knowledge of different women’s likes and dislikes across the globe. Kölbi finds that the British often air on the side of romanticism, while the French and Asian markets tend to be more trend-led. Hearts and clovers will always prove popular. “Love and luck are still the most important things in one’s life, after all,” says Kölbli. But how do you make charms feel modern now? Thomas Sabo’s answer is the Generation Charm Club. Aimed squarely at millennials, it allows for personalisation, and focuses on the meeting together of traditional charms and more trend-lead designs. Customers are being encouraged to sport single earrings, rather than a pair, as well as to mix up their metals (the latest collection encompasses a colour wheel ranging from sterling silver to 18ct gold plating). The German brand is also keen to capture the male charm market. “Younger audiences are more open-minded in doing combinations that haven’t being trialled before,” Kölbi says for this new target market. Her favourite, though, is the “P”, a reference to the first letter of her husband’s name. “When you wear charms, you reflect their message and they help improve your day.” So, if you’re desperate for winter to end, the remedy could be as simple as purchasing a small golden sun for your wrist.